Guess what? I’m doing the A to Z Challenge starting next week. Kindergarten is far behind me, and I thought a little brush up on my alphabet skills might be in order (especially since I’m a writer). One of the first books that stirred my imagination was McElligot’s Pool by Dr. Seuss. I can still remember how that book awakened my creativity with its fantastic imaginary fish. I checked it out from my library countless times. I own it now, and still am awed by the pure imagination painted upon each page. It’s magical. Have you ever wondered about what might have been if certain scenes in history had gone a little differently? Today Sharon Bayliss is here to give us an alternate history lesson based on her new book, The Charge. Without further ado, I’ll let her take Charge (ha ha). 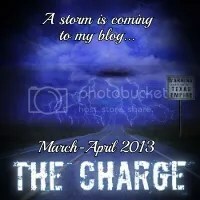 I’m guest posting today at Rebecca Belliston’s March Book Madness. Dribble on over to her site to read what I have to lay up about Weeding Your Words. You’ll score a three-pointer if you do. Okay…enough of the basketball lingo. Back to weeds…in honor of spring. In my post, I will introduce several literary weeds and show you how to eradicate them from your writing. Happy weeding. Life is made up of moments…lots of them. We flit about like bees (if bees flit) from one activity to the next…but how many of these moments are magical to us? Today I have a guest poem by my friend’s daughter, Gabbi. I love this poem’s message. When I read it, it touched me a lot, and I wanted to share. Gabbi hit the truth right on the crayon’s head! Read it and see if you agree.